Anonymous Shirdi Sai Devotee From India Says: Om Sai Ram Pooja ji, Hetal ji and to all Sai’s devotees. As much as I wish to share this divine experience, please understand that I wish to remain anonymous. Thank you. Firstly I would like to say that I am very Blessed to be chosen by Baba Himself to be a part of the Mahaparayan group even though I’m a very new devotee of Shirdi Sai Baba (9 months) and with Sai’s blessings, I would like to share an amazing divine experience. My husband and I are in a long distance marriage and as such I sleep alone at night. This difficult situation is not by choice and I have faith that Baba will end this separation and bring us together soon too. I have always feared the dark, so when I sleep, I need to always have some sort of dim light turned on. Although I don’t have any fear when someone sleeps next to me. Since the past few years, my fear seem to be getting worse that even having the dim light on all night, doesn’t help. Every little sound or movement I hear and feel and it literally makes me jump up from my bed. Sometimes I cry as I am so sleepy but I am so afraid to close my eyes. November 2017 , I was visiting my husband in the US for a couple of months. On New Year’s day this year (2018) I especially went to Sai Baba’s Mandir there to “matha-tek” (bow down as we do in the Gurdwara and on the way out, I was given a huge calendar. When I went home and opened it, I saw the beautiful face of Baba. As my husband is not a devotee of Baba as yet and I believe Baba will also pull him one day as He has pulled me, I didn’t know how to bring the calendar back with me so I was thinking of returning it to the temple before I leave the US. Upon asking someone, it was advised that I should take it back with me as Baba had come to me, so I brought Baba back with me. I put the calendar up on the wall next to my bed as I also use the bedside table next to my bed to do my prayers and parayan reading as I do not have an altar or pooja room. One night, 6 weeks after I brought Sai back with me, I had this dream vision that I was sitting up on my bed and looking at Baba’s calendar but I couldn’t see Baba’s face. I knew in my heart and mind that it was Baba’s photo but I couldn’t see His face. I was seeing dark shadows instead but I kept looking and thinking why can’t I see Baba, so I tried to turn on my bed lamp but it didn’t work. 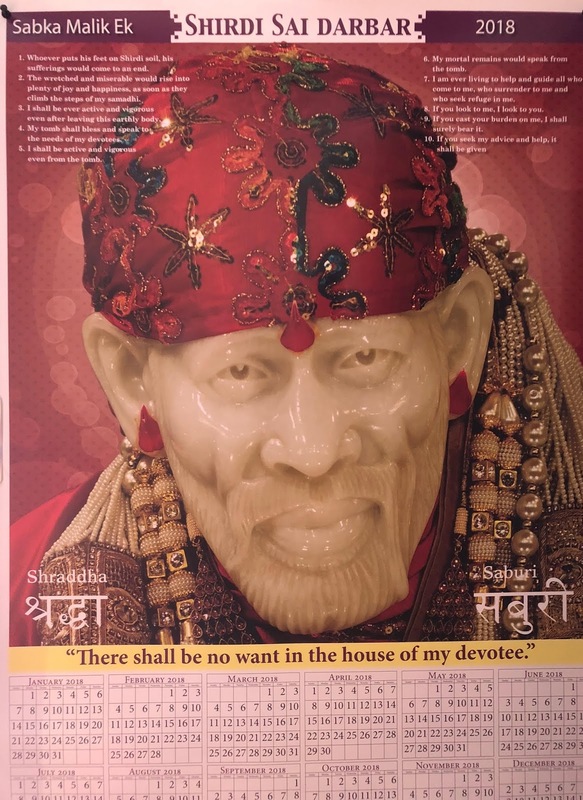 I then looked at the calendar as I knew Baba is supposed to be there and started reciting very loudly “Sai Sai Sai Sai” It was more like I was calling out to Sai. Then there was a little light at the bottom part of the calendar and there was an animated film being projected on it. The moving animation was that of the postcard drawings attached on Hetalji’s site of Devotees’ experiences of reading Shri Sai Satcharitra. I was then able to see Baba’s face on the calendar and His eyes became alive and then it went back to its original photo. I woke up and it was about 2 something in the morning. I just looked at Sai and asked Him, what is the meaning of this dream? I kept playing back the dream in my head and I didn’t realise when I dozed off and woke up in the morning. My husband called me in the morning and after discussing my dream I finally understood its meaning. Baba was telling me that as I am reading Shri Sai Satcharitra and being a part of our Blessed Mahaparayan group and as I also chant Sai Sai Sai, I should not fear anything as Baba is with me and watching over me as I sleep. After that night I have been sleeping well, knowing that Baba is watching over me and that I have nothing to fear. I Love You Sai. Also attaching photo of Sai’s beautiful calendar. The light of Shri Sai naam itself dispels all the darkness from our lives. Baba ever has His eyes on His devotees who surrender and worship Him wholeheartedly. Baba’s children need not fear anything as Baba is always there for them. Similar leela of Baba is also observed in ch 35 of Sai Satcharitra (Insomnia Case of Kayastha Prabhu). Even after 100 years Baba is ever alive. Love You Sai. Jai Jai Ho Sai….! What a beautiful experience. Each time reading everyone's experiences gives me thrill. May Sai's blessings be always showered on all. Dear writer, may all your wishes come true and baba's blessed hands be always there for you.